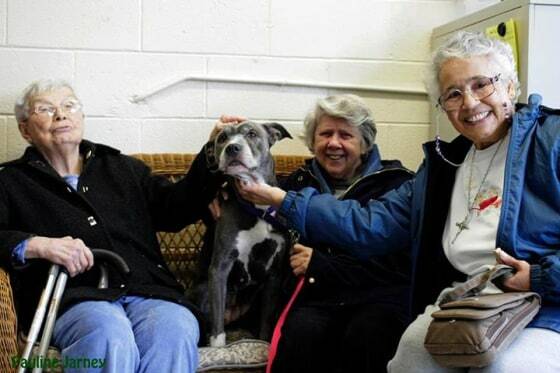 It’s not every day that three women in their 70s and 80s walk into an animal shelter and say they’d like to see a dog that nobody wants. But to Sisters Veronica Mendez, Virginia Johnson and Alice Goldsmith, nuns who live together in Nyack, N.Y., the request made perfect sense. Why not adopt an animal most in need? 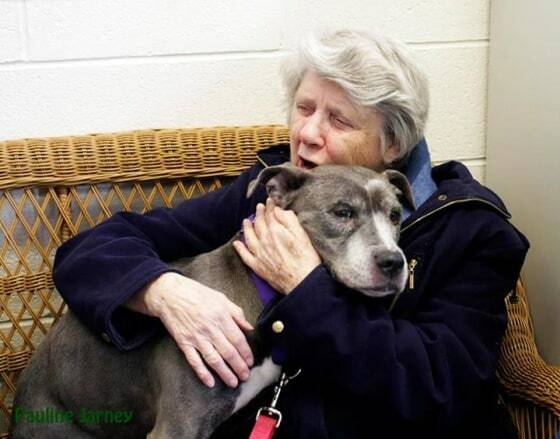 That mindset led them to Remy, a 9-year-old pit bull that had been overlooked by shelter visitors for more than three months. In thousands of shelters across the United States, it’s common for senior dogs and pit bulls to languish, unwanted, before being euthanized. Justin Scally, national director of emergency services for the American Humane Association, said both populations of dogs face stigmas for different reasons. For older dogs, it’s often a perception problem: Many people think it will be too sad to open their homes to dogs over the age of 6 or 7, even though they tend to make the calmest, easiest pets and they’re already house-trained. The nuns’ connection with the dog was immediate. Remy was docile; Remy was sweet. And when given a moment to mingle with the sisters at the shelter, Remy leaned her head into Sister Virginia’s chest and sighed. Looking for love: Remy instantly felt at ease with Sister Virginia Johnson. For the nuns, a four-legged addition to their convent could not come fast enough. They were grieving the loss of their dog Kate, a gregarious 7-year-old mutt who had been a boundless source of energy and comedy in their lives. Kate had left them too quickly. In the course of a weekend, she went from looking healthy to ailing so much from apparent lymphoma that the veterinarian put her down. 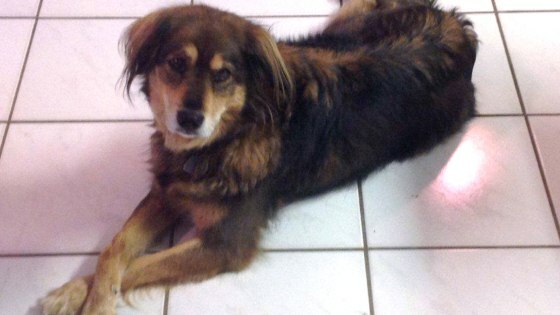 The nuns were bereft when their dog Kate died unexpectedly in January. The sisters rattled around their house crying for one week before they decisively hopped into their car on Jan. 26. Their mission: Rescue a shelter animal on death row. Minutes later, they explained their goal to West Artope, executive director of the Hi Tor Animal Care Centerin Pomona, N.Y. Artope liked these women. He learned that Sister Alice was 87 and that Sister Virginia, while spunky, often used a walker to get around. He made a hopeful connection: Remy. 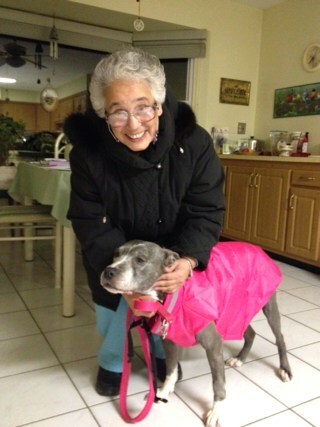 The nuns said they had no concerns about adopting a pit bull because they could tell how good-natured Remy was. They decided not to dwell on Remy’s age, either. Sister Veronica plans to take Remy on many long walks. Between the three of them, Sisters Veronica, Virginia and Alice have spent 179 years serving as nuns. Their main mission has been religious education for children and adults up and down the East Coast. Remy may not realize it yet, but Veronica has a plan for her: To get her a bit more fattened up and lively after her shelter stint, then take her on long walks and contemplative hikes. In her new home, Remy can luxuriate on soft dog beds in multiple rooms, romp in the tree-filled backyard and play with toys donated by well-wishers who were thrilled to hear about her rescue. Remy quickly earned herself a nickname — “Thumper” — because of the happy way her heavy tail goes thump-thump-thump whenever any of the nuns approach her or rub her stiff left hip. Sister Virginia said Remy’s contentment reminds her of foster kids she helped years ago as a social worker. When those children clicked with their adoptive parents, they showed an unmistakable sense of tranquility and relief.